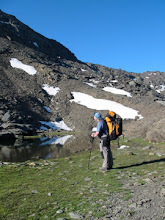 This is a traverse of the main ridge of the Sierra Nevada taking in the 3000m summits. Mike and Jane from Mountain House hosted a party of 5 from Scotland for their guided version of this trek supported by Rik and Dominic (ML trainees) who carried the tents and stoves. The group were all keen Munroists, who had decided to turn their hands (or feet!) to the Sierra Nevada's equivalent. The ridge was gained from Trevelez, near Puerto Trevelez. Ascents were made of: Cerro Pelado (3182m), Puntal de Juntillas (3143m), Picon de Jerez (3088m), El Contadero (3099m), Puntal de los Cuartos o de la Atalaya (3154m), La Mojanera (3135m), Pico de la Justica O de la Atalya (3141m), Atalaya del Cuervo O Pico Cuervo (3147m), Cerro del Mojon Alto (3117m), Puntal de Vacares (3144m), Alcazaba (3369m), Mulhacen (3479m) the highest mountain in mainland Spain, Pico del Veleta (3396m) and Cerro del Caballo (3011m) Europe’s most westerly 3000m peak. The trip spent 6 days walking with 3 nights camping and 2 nights in huts. The nights before and after the trek were spent in a hotel in the Spa Town of Lanjaron. It should be noted that there are different maps to the area and some mountains are named differently and the heights vary from map to map! Although “work” for the Mountain House team, this was a most pleasurable week spent with good company. The mountain house team finally made it to the summit of Alcazaba, the third highest peak in the Sierra Nevada as part of our reconnaissance for the 'Integral' Trip starting this weekend. On the way, Rik and Dom enjoyed some high altitude bouldering! Mountain House Holidays hosted a group of people with Learning disabilities for a “multi activity” week in Spain’s Sierra Nevada Mountains. Rock climbing, canyoning, abseiling, swimming in rock pools, precarious rope bridges, mountaineering (in the snow) to 3205m and even a trip to the beach were enjoyed. Vast amounts of ice cream were consumed and a liking for the local beer was developed by everyone! An exhausting week where people went home for a rest at the end of the holiday!